NOW OFFERED ONLINE in a self-paced course. After completing the Portable Farms® Aquaponics System Course© satisfactorily online, we will ship you the Portable Farms® Kit so you can build your own Portable Farms® Aquaponics System to feed your family FOREVER. The Portable Farms® Kit is included in the price of the course. 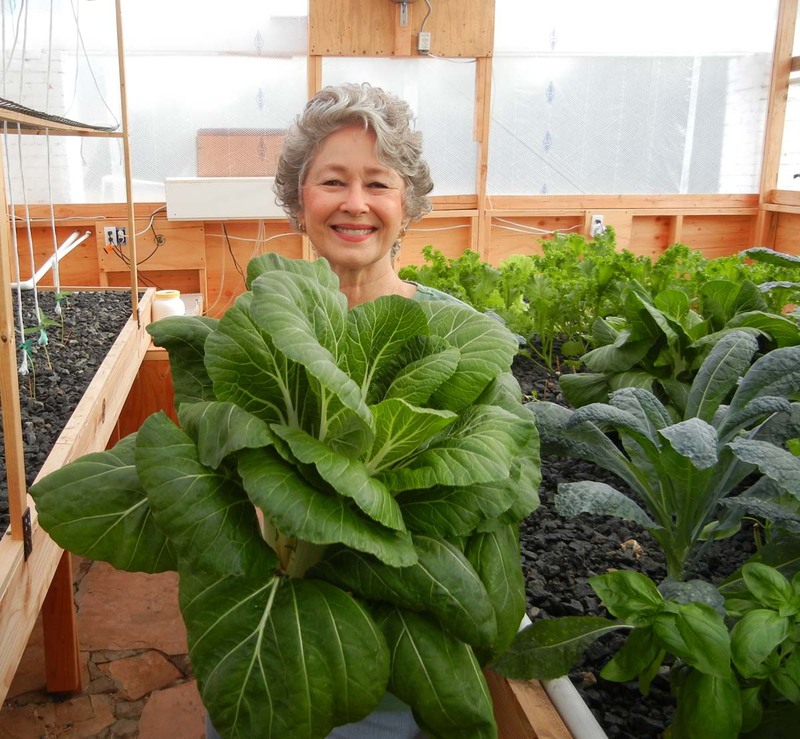 If you want to build your own backyard farm to feed eight people or less, you’ll need to take our ONLINE Portable Farms® Aquaponics System Course© FIRST. The Portable Farms® Kit is part of the course. After completing the Portable Farms® Aquaponics System Course© satisfactorily, we will ship you the Portable Farms® Kit so you can build your own Portable Farms® Aquaponics System. Please note: The ONLY way to purchase the Portable Farms® Kit is by taking the Portable Farms® Aquaponics System Course© FIRST. Our price for the Portable Farms® Aquaponics System Course© which includes the entire assembly, operations and maintenance course. 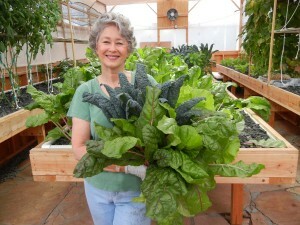 A fresh bouquet of greens (kale and Swiss Chard) grown in 40 days in a Portable Farm. 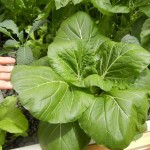 A Gigantic Bok Choy grown in a Portable Farm in 40 days. Most graduates complete this Portable Farms® Aquaponics System Course© in less than two weeks by working on the course only ONE hour per day and after graduation, build their own aquaponics system! Enroll today! 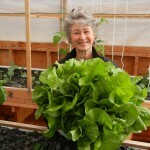 HAVE SOME FUN & GROW YOUR OWN FOOD! Now you can learn to build your own aquaponics system with an easy to follow self-paced online aquaponics course. Begin your training anytime and take all the time you need to complete the course. It’s a FUN course with easy-to-follow chapters and hundreds of images that show and demonstrate you how to build your own backyard aquaponics system. Aquaponics tips and suggestions for your Portable Farm. Sign up today and learn the RIGHT information about aquaponics and receive the technology to set up your own Portable Farms™ Aquaponics System and begin to grow your own food supply. + $140.00 for shipment of Portable Farms® Kits outside the US. Free Shipping within the US. Enroll today: Contact Phyllis Davis, President, PFAS LLC, Co-inventor, Portable Farms® Aquaponics System and Dean Aquaponics University – 804-464-3537 – Phyllis Davis – EMAIL. Phyllis Davis holding 8 kale plants. 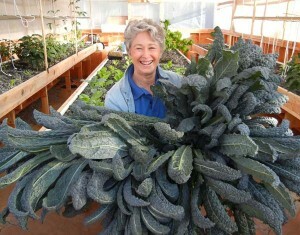 The average length of kale leaves is 47.” This kale was grown in 45 days. Please note. You may ask for and receive a full refund of your tuition until you receive one or more of the sections of of Aquaponics University’s online course offered through classmarker.com for Portable Farms® Aquaponics System Course©. At the point, after receiving the email containing even one section of the Course Material there will be no refund due because you have access to the entire course and you have received a portion of our Intellectual Property and there is proven value as well as benefits contained in that information.